For almost a century, Americans have been losing their hearts and losing their minds in an insatiable love affair with the American musical. It often begins in childhood in a darkened theater, grows into something more serious for high school actors, and reaches its passionate zenith when it comes time for love, marriage, and children, who will start the cycle all over again. Americans love musicals. Americans invented musicals. Americans perfected musicals. But what, exactly, is a musical? In The Secret Life of the American Musical, Jack Viertel takes them apart, puts them back together, sings their praises, marvels at their unflagging inventiveness, and occasionally despairs over their more embarrassing shortcomings. In the process, he invites us to fall in love all over again by showing us how musicals happen, what makes them work, how they captivate audiences, and how one landmark show leads to the next—by design or by accident, by emulation or by rebellion—from Oklahoma! to Hamilton and onward. Structured like a musical, The Secret Life of the American Musical begins with an overture and concludes with a curtain call, with stops in between for “I Want” songs, “conditional” love songs, production numbers, star turns, and finales. The ultimate insider, Viertel has spent three decades on Broadway, working on dozens of shows old and new as a conceiver, producer, dramaturg, and general creative force; he has his own unique way of looking at the process and at the people who collaborate to make musicals a reality. He shows us patterns in the architecture of classic shows and charts the inevitable evolution that has taken place in musical theater as America itself has evolved socially and politically. The Secret Life of the American Musical makes you feel as though you’ve been there in the rehearsal room, in the front row of the theater, and in the working offices of theater owners and producers as they pursue their own love affair with that rare and elusive beast—the Broadway hit. 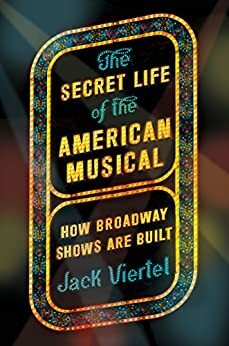 Jack Viertel's new book, "The Secret Life of the American Musical" is a stunningly informative book about the structure and success (or lack thereof) of modern day musicals. In a compelling style, the author takes us through a performance from "Overture" to "Curtain Call" and describes in great detail how every aspect of a musical works. His experience in the world of musicals gives him credence that few other writers would be able to claim. The book is set in a chronological order of a performance and being just a few years younger than Viertel, he helped me relive moments of musicals from my childhood. He particularly enjoys certain ones...."Guys and Dolls", "Gypsy" and "Fiddler", to name just three, but what makes Viertel's knowledge so wonderful is that he ably relates how musicals are set up and executed. I was especially fond of three chapters...."If I Loved You", "Intermission" and "Clambake", particularly enjoying his take on what was served at intermission a half-century ago. He also introduces the reader to things like the "11 o'clock number", a phrase about which I had never heard. His final chapter concerning recordings is a beautiful way to end the book. I must admit that my own experience of musicals is much more confined to those of the fifties, sixties and seventies, so when Viertel launches into musicals beginning thirty years ago to the present...well, those were quicker reads for me. Yet all in all, "The Secret Life of the American Musical" is comprehensive with an nicely produced narrative. It's a must read for those who enjoy and want to know more about the American musical experience. 5.0 颗星，最多 5 颗星Love of the theatre permeates every page! Jack Viertel knows his sh...stuff. As a teacher of musical theatre technique and musical theatre history for more than 30 years, I can see through the charlatans who write books like this. And there are a good number of them. Therefore, it was a total joy to read the real goods from someone who has been a part of that very history for decades. 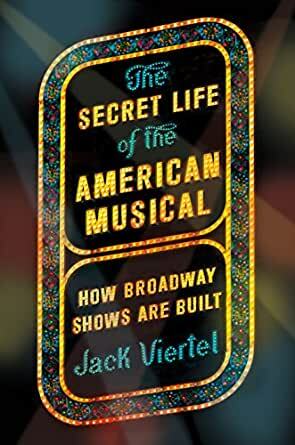 Without being overly anecdotal and chatty, as some of these books tend to be, Mr. Viertel shares insights into the construction of musicals with an academic wisdom and a warm sense of humor. The thing you never doubt - and what really makes the book endearing - is his total and unmitigated passion for his subject matter. And when he does present an idea that is biased or slanted, he tells you so. In advance. For example, I don't know that I would lavish HAIRSPRAY with the amount of attention that Mr. Viertel does, but he reminds us early on that he had a very large hand in the creation of that show, and I think his pride in his own work (it IS an awfully good show) is commendable. I just don't know that it belongs in the same breath as GUYS AND DOLLS and GYPSY. But that's the fun part of being a musical theatre nut - getting to disagree with other musical theatre nuts about favorites! Anyway, if this is your world, this is a MUST, MUST, MUST READ. As a regular audience member at the invited dress rehearsals of the Encores series at City Center in New York, I have grown to look forward to Jack Viertel's introductions of the shows (he is the Artistic Director of Encores) as much as the shows themselves. He is witty and smart, a great teacher and an unabashed theatre-lover. All of that good stuff jumps out of every page of this book. Kudos. Unique book - author writes in a fluid style which compares similarities and differences in well-known musicals. Viertel offers: 1) insights into the formulaic structure of the Broadway musical during the 1940's - 1960's, 2) a deep understanding of this genre - gained from personal experience; and 3) amusing tidbits and Broadway trivia (info on the title of "My Fair Lady" title is a gem). However, as Viertel compares various musicals in a "stream of consciousness" style of writing - he points out similarities that don't necessarily ring true. Sometimes, it feels like he's comparing the proverbial apple & orange. Overall, he's on firm footing, but it really helps to see the live shows or films for the comparisons to make sense. The short scenes in the book don't offer enough material to get the gist of a character or a specific scene. So, before reading, you should see well-known musicals by Oscar & Hammerstein, Frank Loesser, Lerner & Lowe, Bock & Harnick, Jerry Herman, Sondheim, Styne, Bernstein,etc. Fortunately, I've seen most of the shows mentioned, but without a reference point from memory, it would have been frustrating to understand the author's conclusions. For example, I haven't seen "Sunday in the Park with George" by Sondheim, so, the discussion of this show didn't register at all. The best thing about the book by far is Viertel's passion for the stage and his love of musicals - these feelings come shining through. Excellent book, a really nice companion piece to Razzle Dazzle: The Battle for Broadway that I finished last week. Whereas the earlier book made me want to read more about theatre history. The Secret Life.. made me want to listen to and/or go see some shows that I have missed. There were a few places where I felt that the conceit fell apart a little bit (the book is structured like the musical structure it is teaching), but overall it works. This is a textbook, and at times it reads like one, but overall a fun read and very informative. I really loved the recommend cast albums section at the end. Did you ever leave a production thinking, "I loved the music and the singers, but the whole play didn't work for me?" Jack Viertel has masterfully explained why great American musicals work and why many other efforts fall short. Musicals may each be unique, but the successes typically share common elements and structure. This is a wonderful reference for any student of the art. It is expertly studded with examples that bring back memories to long-time theater goers and will likely generate curiosity about historic productions that still deserve an audience.